In the civilian world, the commonly used time system is the 12-hour system where the same notation of time appears twice a day. As a result, the two similar notations must be differentiated with another notation which is AM and PM. This makes it easy to confuse time frames. 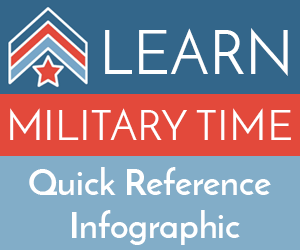 In the military world, a slight confusion of time interpretation can be fatal. Therefore, the military had to improvise a time system which reduces any chances of ambiguity. This brought the adoption of the military system also known as the 24-hour clock system. The system is also popular in firms and institutions where a time misread can cause huge losses. The history of military time can be dated back to the Early Egyptians in the Egyptians 11th Dynasty (est. 2100 BC). The proof was found on the coffin lid which was known as the Diagonal Star Table. Other types of time system were being used in many parts of the world prior to the invention of the 24-hour system. The early Egyptian culture synchronized the time system with certain patterns of constellations that passed through the sky. The patterns would then be used to define the time which would eventually give a year with 360 days. However, unlike today, the Egyptian 24-hour system used temporal hours. These hours were defined by the different amounts of light intensity that was present in different seasons. So as to ensure that night and day had equal hours, the length of an hour was not defined and could be altered from time to time. Around 147 to 127 BC, an astronomer named Hipparchus came up with the idea of a fixed length of time irrespective of the season. The hours were known as equinoctial hours which were determined using the equinox. In this method, an hour lasted 60 minutes where night and day periods were equal. This led to the advancement of the 60 minute time frame use. As world wars progressed, different military forces from different developed nations had to swiftly adapt change to survive. This brought improvements in strategy and communication. This brought about the adoption of the 24-hour clock in the military. Soldiers in the military often communicated with devices while they were distances away to enhance unity and strategies of attack and defense. Due to these, a slight mistake of giving wrong information could cause a wrong move. This was one of the disadvantages of the 12-hour clock system. For instance, in the 12-hour system, it is very easy to confuse 12 midnight and 12 noon. It was also very difficult in the military to do swift calculations in time difference. For example, in the 12-hour system, it is harder to know that something lasts for six hour when told it starts from 10:45 to 4:45. On the contrary, it is easier to comprehend that it starts from 10:45 to 16:45. For these challenges in the 12-hour system, the US Navy adopted the 24-hour system in 1920 which was later adopted by the US army in 1942. Various other armies from developed nations like Russia invented the system in the period of World War two. The US and Britain military forces later made modifications in their 24-hour system format. The two forces used specialized local time zones. An example is zone J, for instance, 1200J meaning noon (12PM). The two armies also used hundreds when telling the time. For instance, 1000hrs is read as ten hundred hours, not a thousand hours. Any zeroes must be read when communicating. For example, 0600hrs is read as zero six hundred hours, not six hundred hours. These modifications were made to bring a common understanding of the message sent to all the soldiers of the military. The 12-hour system is still commonly used in the USA, English speaking Canada and Great Britain. However, as technology advances, the use of the 24-hour clock system has been adopted in various areas where mistakes can easily be made. Pilots, scientists, and polar explorers have now adopted the 24 hour time system since in most cases; their locations have prolonged sun appearance or darkness. Night time that extends for almost the whole day can disorient an explorer. Disciplines that perform high sensitive tasks like hospitals and intensive care units also use the 24-hour system to administer treatments. A slight mistake in drug administration can cause death to a patient. The history of military time continues to be written as the world adopts, adapts, and tweaks the system for the needs of a changing global community.